In Web Parton’s snake-avoidance clinic, dogs learned to recognize snakes by smell, sight and sound, and then they were taught to give the critters a wide berth. I’ve spent plenty of time hunting in snake country, but I always worried more about a snake biting one of my dogs than about one biting me. While we may know enough to avoid snakes to the best of our ability, dogs may react with curiosity or aggression. Several of my friends have had bird dogs bitten seriously. Some years back our Arizona neighbors Barb and Ron Rodgers received a rough welcome to the Southwest when their English setter Sophie acted unusual after a run. Inspection revealed swelling on her lower chest, so they exercised good judgment and rushed her to care. Their veterinarian confirmed a snakebite and, thanks to prompt treatment, she lived to hunt again. 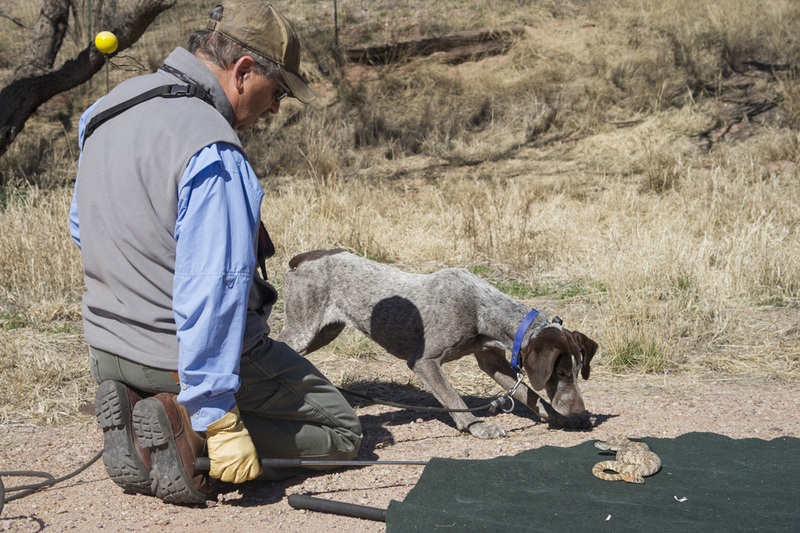 Anxious to avoid repeating that experience with Trigger, their new young setter, Barb and Ron joined Tom and Sharron Sullivan at our place one recent Arizona spring morning. They had put bird dogs through snake-avoidance clinics before, but their description of those experiences reminded me of Thomas Hobbs’ three-word description of life for primitive man: nasty, brutish and short. While we all wanted our dogs safe in snake country, none of us was eager for that. That’s why, upon the advice of friends, I’d asked well-known guide and trainer Web Parton to conduct this clinic. Parton began by talking to us for an hour over coffee on our patio, explaining exactly what would happen during the morning and why. In light of his earlier experience, Tom was particularly anxious about his sensitive shorthair, Kelly. I could see him relax visibly during the discussion as Parton explained how he would train the dogs to recognize snakes by sight, smell and sound and use gentle correction to teach avoidance. Then we went to the yard, so Parton could meet the dogs. He teaches in groups, so that the dogs can learn from each other, and considers six an ideal number. Four of my wife Lori’s and my dogs rounded out the class: Max and Maggie, our wirehairs; Rosy, our Lab; and Molly, Lori’s Jack Russell. Parton spent some time getting to know each dog and making sure each felt comfortable in its place among a semicircle of handlers. Then it was time to meet some snakes. Sixteen species of rattlesnakes inhabit the US, and it’s not feasible to expose dogs to all of them in a clinic. However, the Western diamondback resembles the rest sufficiently to serve as a model, and Parton had brought two of them. First, though, we’d start with a docile speckled rattlesnake to introduce the dogs to the process of recognition. While each dog sat in its established safe place, Parton checked the snakes and removed some fangs that had regrown since his last clinic. Then he drew the dogs’ attention to a carpet placed on the ground by activating an electronic predator call beneath it. After observing their responses to a series of coyote and wolf vocalizations, he suggested a ranking from most sensitive dog to most aggressive. Having hunted or lived with five of the six dogs, I agreed completely with his assessment. Anyone familiar with Jacks will know which dog wound up on the tough-guy end of the scale. Next Parton used a snake hook to lift the speckled rattler onto the carpet. One at a time each dog’s handler led his charge toward the snake from downwind, beginning with Trigger, the most sensitive. The point of this exercise, which involved no correction, was simply to expose the dogs to the smell of the snake and gauge their reactions, which varied considerably. Kelly was cautious. Maggie was curious. Molly wanted to break her lead and kill the snake. By the time we were done, I understood why Parton trains in groups. Each dog was paying attention to the dog on the lead even when they were sitting quietly in the rear. Parton emphasized that no method of training dogs to avoid snakes is totally effective. Next came a diamondback, which, in contrast to the first snake, was active and buzzing. We repeated the process, again with no correction, so each dog could learn to recognize the snake by sight and sound as well as smell. Parton previously had emphasized that a dog cannot identify a snake visually unless it’s moving, as we had confirmed with the listless speckled rattler. After meeting the diamondback, each dog knew the look and sound of a snake. Then the second diamondback entered the ring for round three. This time Parton watched each dog carefully as it approached the snake, and when it demonstrated its own signs of recognition, he administered a low level of correction with an e-collar. All of the dogs had had at least some exposure to e-collars, which Parton recommends prior to a clinic. When a couple of the dogs showed no evidence of response, he increased the setting until they flinched briefly. That was it—no howling or turning inside out. As Parton had stressed, a dog that is stimulated to the point of panic isn’t learning. We next moved the snake across the yard and repeated the process, so the dog would associate the correction with the snake and not the location. Then we put each dog through a final walk-by to confirm avoidance behavior. Max and Maggie each required one last nick from the collar before they graduated. Demonstrating an interesting behavior Parton says he sometimes sees in search dogs and Labs, Rosy inserted herself in front of me and nudged me away from the snake when I walked her in. I may hunt her from heel in the upland cover next season for my own protection. Molly, who began the clinic trying to break her leash and bite the poor rattler in two, turned and ran backward at the first whiff of the snake. In our concluding discussion, Parton emphasized that no method of training dogs to avoid snakes is totally effective. While he knows of no dog among the thousands that have been through his clinics that was bitten by a snake during the day, he does know of a few that have been bitten in the dark. He also pointed out that each handler now knew how to read his dog’s body language when it encountered a snake. In addition to making our dogs safer, we had created distant warning systems for ourselves. Regrettably, Web Parton is retiring. So this piece is not a recommendation of a trainer but an indication of what to look for in a snake-avoidance clinic: above all a trainer with a feel for dogs as individuals and a willingness to invest time in their education. A Google search of “snake avoidance training” will lead to the names of dozens of clinics around the country, likely including some in a location near you. It also will reveal some highly negative opinions based on limited experience with the Thomas Hobbs version of the process. One reason I wrote this piece is to show that not all clinics are nasty, brutal and short. How can you tell the difference? The best way is to ask friends or other members of your local bird hunting community for a reference, as I did. If that’s not possible, ask for references from the clinic, and contact as many of them as possible. The development of a vaccination against rattlesnake venom has created another line of defense against lethal snakebite in gundogs. It is important to realize that this is different from the antivenin administered after a bite, which contains previously formed antibodies that neutralize the venom in the dog’s body. Administered in advance, rattlesnake immunization is like a flu shot. It contains substances chemically similar to venom but nontoxic, priming the dog’s immunologic memory, so it can develop its own antibodies more rapidly after a bite. The manufacturer (Red Rock Biologics) recommends two doses 30 days apart at least six weeks prior to potential snake encounters followed by “booster” doses annually before hunting season. Small dogs and dogs at high risk of snakebite throughout the year may require more frequent boosters. Almost everyone agrees that the vaccine is safe. At an approximate price of $30 to $40 per dose, it is much cheaper than post-bite antivenin, which can cost $1,000 or more. The problem is lack of rigorous data proving effectiveness. While the vaccine does lead to an increase in antibody levels after a bite, its effect on survival is less certain. Many veterinarians feel that it may give a bitten dog more time to receive definitive care and recommend it. Others don’t. It has no effect on bites from coral snakes, water moccasins and Mojave rattlers, and it is absolutely not a substitute for prompt veterinary care after a bite. Discuss the pros and cons with your vet. Despite avoidance training, you suspect that a snake has bitten your dog. What next? Forget everything we were taught about snakebite when we were young: no ice, tourniquets, incisions or suction. • As in any crime scene, first secure the area to prevent another bite. Recognize that more snakes may be nearby, especially during the fall. • Determining the snake’s species helps guide treatment. Identify or photograph the snake if you can do so safely. • Not all snakes are venomous, and not all bites from venomous snakes result in envenomation, but treat every bite as an emergency until proven otherwise. That may be difficult in the field. • Remove potential sources of constriction, such as collars or boots. • Calm the dog and evacuate it from the field as soon as possible, even if the dog appears well. Know the location of the nearest veterinary clinic in advance. Contact the clinic as soon a possible to inform personnel of your situation. • If possible, carry the dog and elevate the affected part of the body. Some recommend carrying an over-the-counter antihistamine such as Benadryl for field administration to reduce swelling. I don’t, because evidence from human medicine does not support it. Discuss the matter with your vet. Ninety-eight percent of the proceeds from sale of the Federal Duck Stamp go to the Migratory Bird Conservation Fund, which supports the purchase of migratory bird habitat for inclusion into the National Wildlife Refuge System.